Ever since we signed up for baby registries, we've gotten all sorts of emails and catalogs from kid retailers. Not that I mind one bit since I can get ideas for the nursery, but I will say that most of the time, its all the same kind of stuff that they're trying to sell you. Well, the other day I received the Pottery Barn Kids catalog and figured it would have the same 'ol things I've seen online, but I just thought I would glance through it while eating lunch. SO glad I did, because I came across a very good find, not just for nurseries but for any room in your home. 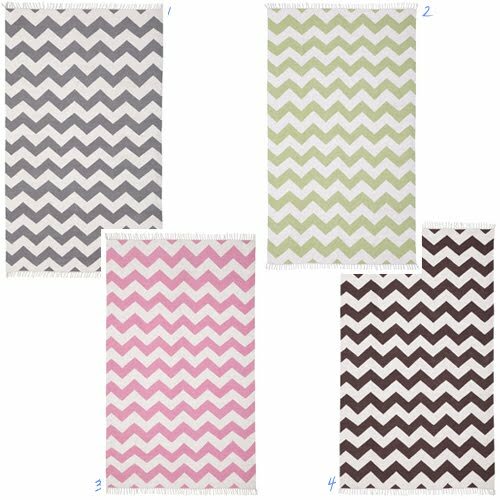 The Chevron Dhurrie Rug that PBKids offers is so affordable and comes in adult-friendly colors, I still can't believe how affordable it is (an 8"X10" for $499!). 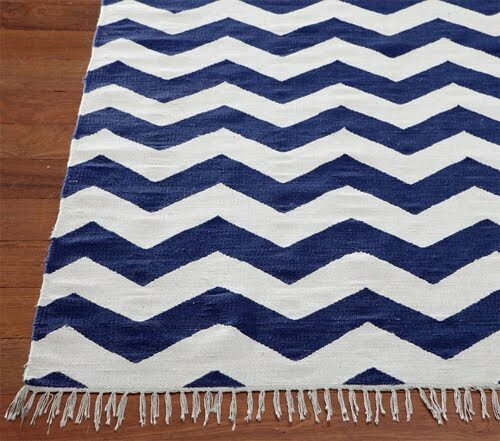 This rug could go anywhere. I would use it in an entry way or in the kitchen if I had extra money to spare. Hurry and get yours before they're backordered completely (they've already started backordering for some of them).